Mumbai: After a delay of four months, India’s largest airline Jet Airways (India) Ltd on Thursday secured approval from the cabinet committee on economic affairs, or CCEA, for raising up to $400 million (Rs1,872 crore) by selling shares to foreign institutional investors. Jet Airways had opted for FIPB clearance as the company is controlled by a non-resident Indian, Naresh Goyal, through an overseas corporate body, Tail Winds Ltd, his investment company registered in the Isle of Man. Executive director Saroj K. Datta did not return calls seeking a comment on CCEA’s decision. Another senior Jet Airways executive, who didn’t want to be named, said the airline would seek to raise the $400 million in two phases. Jet Airways can use the money to reduce the debt on its books or utilize it to pay instalments towards the 2007 acquisition of Air Sahara, renamed JetLite, said one analyst. At the end of the fiscal second quarter on 30 September, Jet Airways had debt of $3.3 billion and needed to make repayments of $300 million in the next one year. 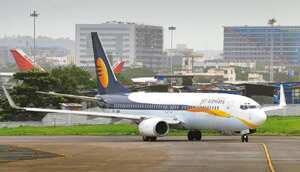 “Anyway, it will help Jet Airways to lower the debt and cost of servicing it," said Mahantesh Sabarad, senior analyst at domestic brokerage Centrum Broking Pvt. Ltd.
Other private carriers such as Kingfisher Airlines Ltd and SpiceJet Ltd are also considering raising funds. Kingfisher Airlines is in talks with private equity investors to raise $400 million and use the proceeds to pay debt, chairman Vijay Mallya told reporters in November. “First of all, Jet Airways may not opt for raising entire $400 million at one go because there will be limited interest to subscribe to a large capital issue," said Sabarad. “As a natural fallout, the extent of stake dilution by its promoter Naresh Goyal will be restricted as the share prices have substantially appreciated since the airline applied for an approval with FIPB." Shares of Jet Airways have risen 124.11% to Rs553.55 at Thursday’s close on the Bombay Stock Exchange from Rs247 on 24 July, when the airline’s board approved raising additional capital of up to $400 million. Jet Airways is expected to post strong passenger growth numbers and yields in December, aided by the holiday season, analysts Anand Kumar and S. Arun of DSP Merrill Lynch Ltd wrote in a 21 December report. “This should enable Jet to break even for the first time in the last seven quarters." With a market share of 27% in November, Jet Airways has a fleet of 111 aircraft and operates more than 410 flights daily.